Hey farmer, it’s your pal Darryl! I’m here with my big sis’ Felicia. We volunteered to be this year’s commentators for the biggest Firefighter event of the year! You ready? It’s the annual Firefighter Ski Race! Woot Woot! The best part is, all monies raised here today will go to Charity! Oh yay and here come the firefighters now! WAHOO! Yep! Give ‘em a hand everyone! Each firefighter team will have to ski down the mountain while carrying a 50ft long firehouse! The first team down the mountain WINS! Oh ya, William! It’s his first time competing! He’s been practicing day and night for months for this! Gonna be a GREAT RACE! Oh look, THERE he is now, does he look nervous? He sure does Darryl but only cause he’s talking to ANNABELLE from the rival team. William has a HUGE crush on that girl! Look he’s getting all clumsy and awkward now! Geesh, let’s hope he can get it together before the race begins……Aaaand here they go on the ski lifts, up up and away. They’re at the top and it’s GO TIME folks! GO GO GO! Both teams are off to a great start, neck and neck racing down hill! It’s anyone’s guess who will win this! I wonder what’s going through William’s mind right now! 1. Brrr. So cold! Good thing I wore my wooly underpants! Come on now William you gotta win this race! Do it for the team, do it for props, do it to impress Annabelle! FASTER FASTER! 2. Haha! YES!! We FLEW past the other team…including Annabelle and oh boy did she smell good…like a meadow of Daisies….Ugh, stop it William! Stay focused! Eye on the prize! 3. YAHOO! We’re still in the lead and by a long shot; we’re gonna win. Finish line here we come! Oops, forgot about the turn off at Icicle Crossing! Yikes, which way? 4. Phew! Good choice but YIKES WATCH OUT FOR THAT GOOSE! Phew, close call and dang now the other team’s catching up to us! Oh no you don’t…we can’t let it happen farmer! Let’s GO! 5. YES! We’re back in first place again but that’s when Annabelle called out to me with that cute lil’ nose and fuzzy alpaca toque of hers. I had to look back and wave at her! 6. SPLAT! And with one tiny glimpse of that heavenly Annabelle, BAM! My knees got weak, I wobble out of my boots and KERPLOW; face first into a snowbank! NOW which way? 7. UGH! It’s too late! Annabelle’s team just crossed the finish line! Ah, well it was all for fun right? I’ll pick some flowers to congratulate Annabelle on a race well run! 8. By the time we caught up they were already into the champagne! We all congratulated them while they listed off EXACTLY what they wanted us to make them for breakfast! 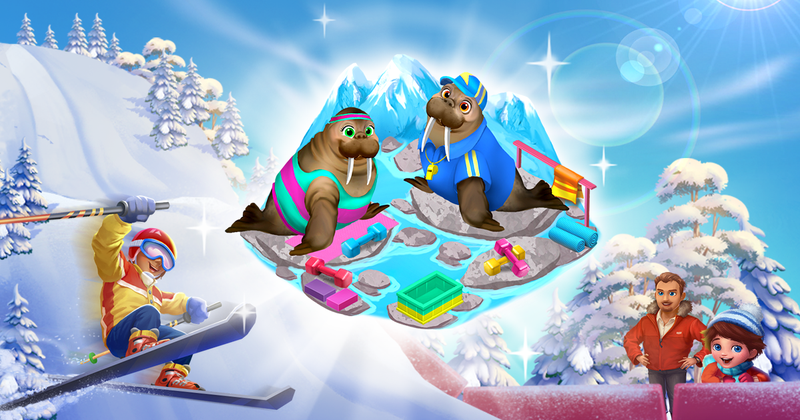 Rewards: Purple Voucher, Ice Dolphin, Sea Cucumber Pond, Winter Walrus.